I have always been in the lookout for new awesome products, which I could try and share with you guys. One of the local brands, which never fail to amaze me, is Snoe Bauty and if they’re coming up with something new, I’m so itching to try it out. I’m actually amazed by how far this young brand has gotten and it’s one of the local brands I often rave about. I do have international readers and blogging about awesome local products and brands just makes me so proud to be a Filipino. The current loose powder I’m using is the Snoe Body Ritual Recipes Fresh Custard Face & Body Powder. I’ve been eyeing on this product since it went out on the Snoe shelves; so without further ado, let me tell you what I love and don’t love about this loose powder. First of all, I love the stuff they put in this loose powder. It has Argan Oil (Argan Oil in a powder? Pretty awesome, right? ), Acai Berry (acting as an anti-oxidant) and has sunscreen to protect us from the harmful rays of the sun. It’s a translucent powder, which you can use to set your foundation. Actually, I don’t use much foundation especially when I’m off to work so I only use this powder and it does its job well. It keeps my face from being shiny, shimmery and splendid (LOL, got used to it. Now you know I’m an Aladdin fan, eh?). Oh, and you can also use it on your body. I actually recommend this to High School students who are not allowed to wear makeup at school. This will be a perfect face and body powder for you. Oh and it’s not expensive. It’s only P249.00! The scent doesn’t bother me but it does bother some people. I remember when I was putting makeup on someone; she kind of didn’t like the scent. So, people may or may not like the scent. And, it’s a bit hard to use it as face powder because I usually use a brush in powdering up my face and it just gets pretty messy when I was using it for the first few days. Glad I’ve gotten used to it now because I like the product. I’m giving this product a rating of 8/10. It’s a product I recommend especially to those younger ones (tweens and teens). It takes the shine off of your face and gives off a nice scent (at least, for me). 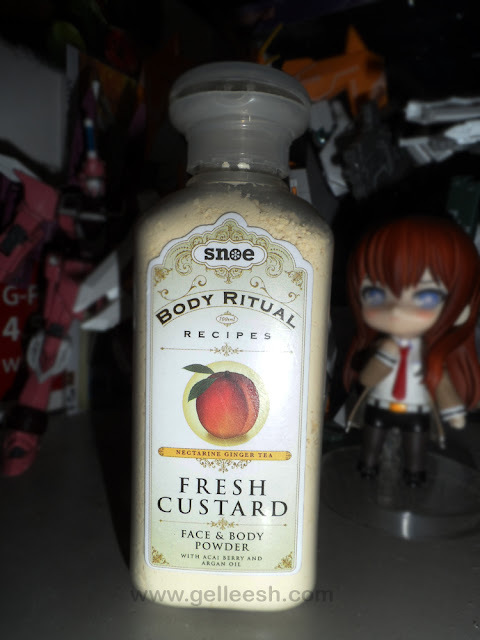 The Snoe Body Ritual Recipes Fresh Custard Face & Body Powder comes in 5 variants: Nectarine Ginger Tea (MINE), Vanilla Bean & Butterscotch, Honey Dew Melon Yogurt, Strawberry Smoothie and Tropical Cocktail. If anyone of you have tried this one, please do tell me what you think at the comments section below, okay? Argan oil + acai berry + sunscreen in one? Cool! You should try it as highlighter. Substitute for yellow powder of cinema secrets. Trust me!